For children, internet access is a double-edged sword. In other words, being able to get online can be both good and bad for kids. On the good side, digital technology can connect a child to information and to a larger community. It can bring future opportunities for work and career. But on the bad side, it can also bring great harm and stress – especially for a child who does not know how to use the internet thoughtfully. A new report from the United Nations International Children’s Emergency Fund, or UNICEF, explores both the good and bad of the internet for young people. Being online has many benefits. In fact, access to the internet can change a child’s life, says Laurence Chandy. He is the Director of Data Research and Policy for UNICEF. "We sincerely believe that -- especially for kids in places where opportunities are few or for children who are disabled, living in remote places -- it is completely intuitive that the internet has enormous potential and is already helping children access opportunity that just wasn't conceivable not long ago." Students learn with the help of a computer tablet provided by UNICEF at a school in Baigai, northern Cameroon, Tuesday 31 October 2017. UNICEF initiated a pilot project in January 2017 called ‘Connect My School’. But the UNICEF report estimates that around one-third of the world's youth -- most in developing countries -- are not online. For example, in Africa, only 40 percent of children are online. In Europe, by contrast, 88 percent are. These offline children, the report notes, are missing out on the benefits offered by internet access. We call the gap between those who can easily get online and those who can't the "digital divide." Experts at UNICEF say the digital divide is not fair and needs to change. They stress that children everywhere must have access to the tools that will help them to participate and compete in an ever-growing digital economy. UNICEF reports that one in three internet users around the world is a child. Even though so many children are online, the organization says little is known about the impact of digital technology on child's well-being. More importantly, the report finds that little is being done to protect children from the dangers of the digital world. For example, many children around the world have a digital footprint before they can actually walk and make real footprints. Parents often post photos of their children and share stories about them. And a child’s medical records may be stored in the cloud. As children grow, they may share additional details about themselves or photos and videos of themselves. But making all this personal information public may put a child at risk. Lawrence Chandy explains that these risks include the misuse of children's private information, access to harmful content and cyberbullying. 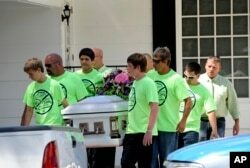 These children in Florida wearing anti-bullying t-shirts carry the casket of their classmate, Rebecca Sedwick. In 2013 at age 12, she jumped to her death after being bullied online. Besides, cyberbullying, Lawrence Chandy says children are also at risk from online criminal networks. These criminals target children for some of the worst forms of exploitation and abuse, such as human trafficking and online child sexual abuse. He says safeguarding children's privacy on the internet is an issue of major concern. "We really emphasize the importance of putting in place safeguards to prevent children's personal data from falling in the wrong peoples' hands and protecting their identities. This is an issue which is only going to grow in importance." UNICEF is asking governments, schools, businesses in digital technology and telecom industries to make these two things priorities: giving more children access to the internet; and then protecting them when they are online. If your child is online, the website Parenting.com gives the following safety advice. Know the online sites your child uses. You know the physical places where your child hangs out and who they are hanging out with. So, you should also know where they are online and with whom. Set house rules. Decide how much time your child spends online and how they use the internet. - not to get together with anyone they "meet" online. Keep the computer in a central spot in your home. It is easy to watch your child’s use of the computer if the device in a commonly-used area, like the kitchen. Use software and other technologies to your advantage. Use safe-surfing options such as filters and privacy settings on your child’s browsers. But know that a child who knows computers may be able to change these settings. Parents, caregivers, teachers and school administrators, businesses and policymakers need to work together to ensure safe access and protect children from the possible harm of an every-growing digital world. Lisa Schlein reported this story for VOA from Geneva. Anna Matteo adapted it for Learning English, adding additional information from the UNICEF report, several new agency, parenting and government websites. Kelly Jean Kelly was the editor. remote – adj. far away from other people, houses, cities, etc. disabled – adj. having a physical or mental disability : unable to perform one or more natural activities (such as walking or seeing) because of illness, injury, etc. digital footprint – n. the information about a particular person that exists on the Internet as a result of their online activity.